The ideal Don Hairless is medium-sized and has large ears. The cat is muscular, has almond-shaped eyes and long, webbed toes. They have an elegant appearance and strong boning. They come in a variety of colors. Don Hairless are very affectionate and interactive with their owners. They are active and need a lot of attention. Although they don’t have fur, Don Hairless still need a lot of grooming to keep their skin healthy. They must be wiped down daily with a damp cloth to remove sweat. Don Hairless need frequent grooming to keep their skin healthy. Overbathing can cause the Don Hairless’ skin to become oily. Don Hairless are prone to sunburn and should be kept indoors. The breed becomes cold easily and should be protected from draughts. The Don Hairless was developed in Russia in 1987 when a breeder named Irina Kovalyova discovered a hairless cat in the city of Roston-on-Don. Kovalyova discovered that the hairless cat she had found was not related to the Sphinx, but resulted from a different genetic mutation. The cat, named Vayra, was bred to Domestic Shorthairs and European Shorthairs to create kittens that carried the dominant hairless gene. 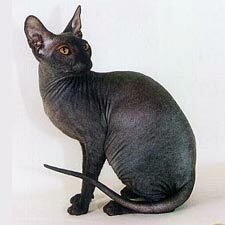 In 2005, the Don Hairless was recognized as the Donskoy in the U.S. by The International Cat Registry (TICA.